For those who like to learn about how massive low-income, underfunded school districts like CPS can improve, here’s a webcast that might be of interest to you. I suspect that much will be based on the truly challenging environment of the very low-income schools. I saw a recent documentary on one of these schools and it is pretty astounding what some of these principals have done. It’s not just a matter of teaching differently or better, but a whole mindset towards the students and parents and how the school involves them and interacts with them. Unfortunately it feels more like an art than a formula that can be rolled out in CPS. But if you’re sitting at a desk with listening time, it might be interesting…. Entry filed under: Uncategorized. 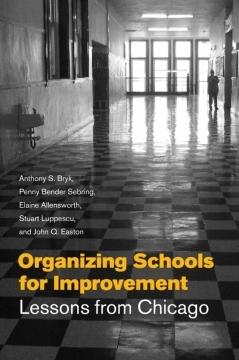 Tags: Organizing Schools for Improvement: Lessons from Chicago.